The true randomness comes from where this card turned up – face up, next to my car as I got out in a Trader Joe’s parking lot. For a moment, I wondered how it got there. Did someone drop it out of their car after visiting some yardsales? Did the wind, or magical cardboard messenger birds or some other mysterious force of nature carry it to that spot after lifting it out of someone’s collection put to the trash curb by mom? It’s funny how I find interesting things in grocery store parking lots. Some years back, I headed back to my car and discovered a brand new pair of Ray-Bans sitting next to it. On another occasion, I found a near-mint copy of the paperback photonovel of “The City On The Edge of Forever” from Star Trek after nearly running it over when I pulled into the space. And yet another time, I found a brand new Ferrari that someone left behind. I hung around for a little while to see if they’d return to get it, but then I gave up, hotwired it, and drove it home. Finders keepers! 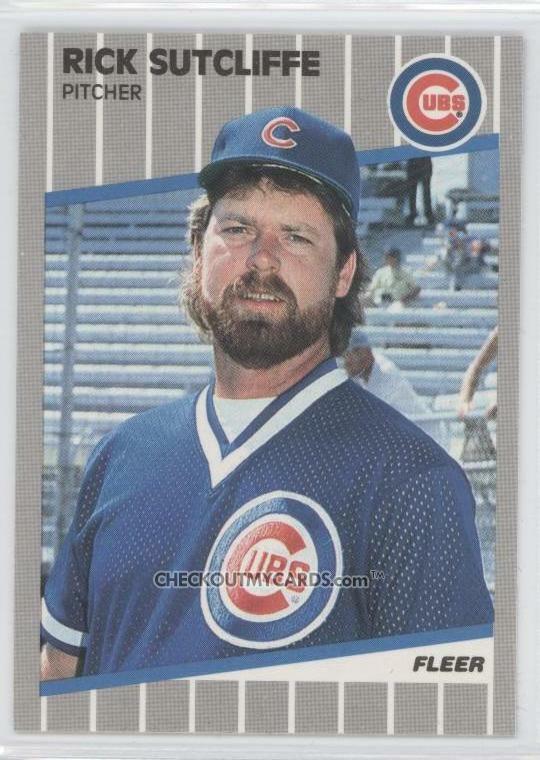 Today, the magical forces of fate brought me to Rick Sutcliffe. I guess if I really did believe in synchronicities like my alter-ego in Cut To Wagstaff, I’d have found some sort of significant thing about Sutcliffe in 1989 that would have determined my actions for the rest of the day & I would have found myself on some sort of off-the-wall mysterious adventure. But my life really doesn’t work that way. I put the cheap wine & TJ’s knock-off cereals into my car, drove home, played with the cat, and watched the Yankees tragedy unfold. Sutcliffe certainly had an up and down career. There’s really no other way to describe a guy who wins the comeback player of the year award TWICE, once in each league, after winning Rookie of the Year and a Cy Young. Sutcliffe has been a mainstay at ESPN for the past several years, as well as MLB network. I’m still not sure why a 23 year old card, beat up pretty badly, should be waiting for me while I ran some weekend errands. I had even made a small detour to a yardsale earlier – and it was being run by a couple of toy collectors cleaning out their stash. They had some old board games and tons of Barbies and Hot Wheels, all e-bay priced which made it nearly a total waste of time – I was saved by finding this compendium cookbook of chicken recipes for only a dollar. But no baseball cards. I guess you have to troll Trader Joe’s parking lot for that, although the other day I coughed up serious thrift store bucks (meaning more than singles) to get the 40th Anniversary Topps Baseball Card picture book. Granted, having the actual cards is always better, but the book has been fun to browse through, and I can even see all the ones that got away. I enjoyed your story and have a number of similar experiences surrounding my parked car. Always seem to be finding interesting and curious things around the car. Especially car keys, I would never have stolen a car, especially, and Italian headache like a Ferrari. Sudcliffe, I only have name recognition and a realization that he was a fine ball player, but never realized he had significant accomplishments in both leagues.